41-Syn, a truncated peptide that plays a crucial role in Dopamine Homeostasis. Figure from :Moriarty G.M. et al. J Biol Chem. 2017 Jul 14. pii: jbc.M117.780528. doi: 10.1074/jbc.M117.780528. A pH Dependent Switch Promotes β-Synuclein Fibril Formation via Glutamate Residues. 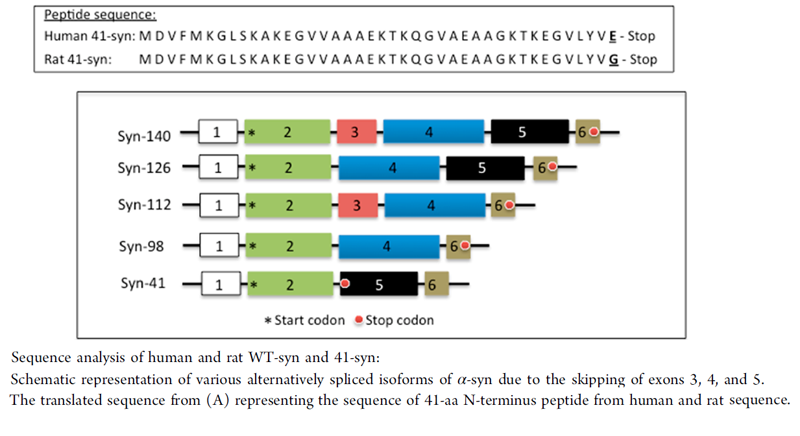 Identification of an Alternatively Spliced α-Synuclein Isoform That Generates a 41-Amino Acid N-Terminal Truncated Peptide, 41-syn: Role in Dopamine Homeostasis. The presynaptic protein, α-synuclein (α-syn), has been shown to play a crucial role in multiple neurodegenerative diseases, such as Parkinson's disease (PD), Alzheimer's disease (AD), and dementia with Lewy bodies (DLB). The three major domains of α-syn protein were shown to govern its membrane interaction, protein fibrillation, and chaperone activity. So far, four different alternatively spliced isoforms of α-syn, which lack either exon 3 (syn-126) or exon 5 (syn-112) or both (syn-98) resulting in altered function of the proteins, have been identified. In the present study, we have identified the smallest isoform of α-syn due to the skipping of exons 3 and 4 generating a 238 bp transcript. Due to the presence of a premature stop codon, the 238 bp transcript generated a 41 aa N-terminal peptide instead of the 78 aa protein, which is secreted into the extracellular medium when overexpressed in cells. The presence of 41-syn was initially noticed in the substantia nigra of PD autopsy tissues, as well as in cells undergoing oxidative stress. In vitro studies inferred that 41-syn neither aggregates nor alters the aggregation propensity of either WT or 112-syn. Overexpression of 41-syn or treatment of cells with 41-syn peptide did not affect cell viability. 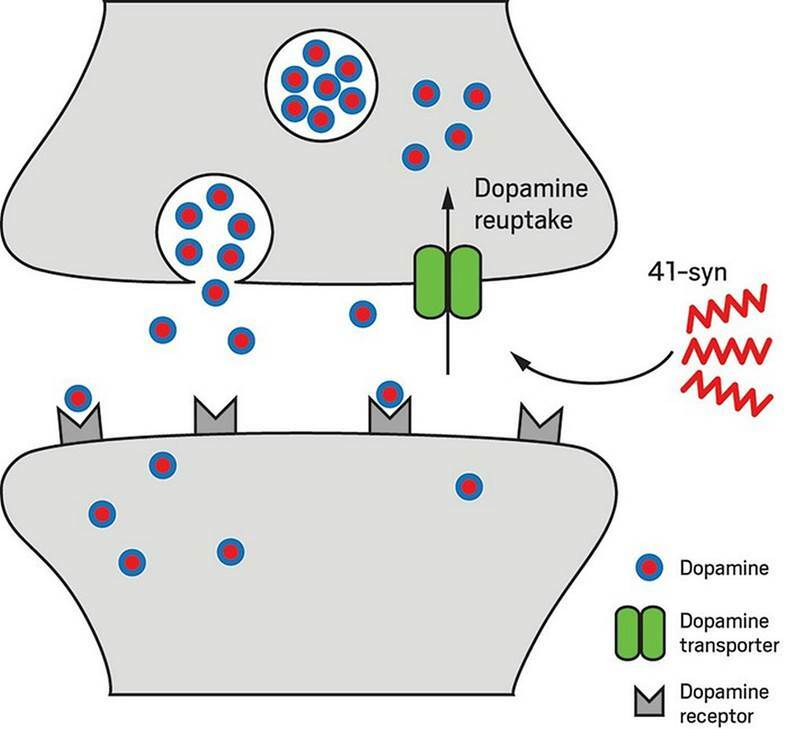 However, PC-12 cells treated with 41-syn exhibited a time and dose dependent enhancement in the cellular uptake of dopamine. Based on the physiological role of the N-terminal region of α-syn in modulating membrane trafficking events, we believe that the identification of 41-syn may provide novel impetus in unraveling the physiological basis of alternative splicing events in governing PD pathophysiology. A pH Dependent Switch Promotes beta-Synuclein Fibril Formation via Glutamate Residues. Alpha-synuclein (αS) is the primary protein associated with Parkinson's disease, and undergoes aggregation from its intrinsically disordered monomeric form to a cross-β fibrillar form. The closely related homolog beta-synuclein (βS) is essentially fibril resistant under cytoplasmic physiological conditions. Toxic gain of function by βS has been linked to dysfunction, but the aggregation behavior of βS under altered pH is not well understood. In this work, we compare fibril formation of αS and βS at pH 7.3 and mildly acidic pH 5.8, and demonstrate that pHserves as an on/off switch for βS fibrillation. Using αS/βS domain-swapped chimera constructs and single residue substitutions in βS, we localize the switch to acidic residues in the N-terminal and NAC (non-amyloid component) domains of βS. Computational models of βS fibril structures indicate that key glutamate residues (E31, E61) in these domains may be sites of pH-sensitive interactions, and variants E31A and E61A show dramatically altered pH-sensitivity for fibril formation supporting the importance of these charged sidechains in fibril formation of βS. Our results demonstrate that relatively small changes in pH, which occur frequently in the cytoplasm and in secretory pathways, may induce the formation of βS fibrils and suggest a complex role for βS in synuclein cellular homeostasis and Parkinson's disease. T cells from patients with Parkinson's disease recognize alpha-synuclein peptides. Genetic studies have shown the association of Parkinson's disease with alleles of the major histocompatibility complex. Here we show that a defined set of peptides that are derived from ?-synuclein, a protein aggregated in Parkinson's disease, act as antigenic epitopes displayed by these alleles and drive helper and cytotoxic T cell responses in patients with Parkinson's disease. These responses may explain the association of Parkinson's disease with specific major histocompatibility complex alleles. Sulzer D, Alcalay RN, Garretti F, et al. Nature. 2017;546(7660):656-661. The involvement of dityrosine crosslinking in alpha-synuclein assembly and deposition in Lewy Bodies in Parkinson's disease. Parkinson's disease (PD) is characterized by intracellular, insoluble Lewy bodies composed of highly stable α-synuclein (α-syn) amyloid fibrils. α-synuclein is an intrinsically disordered protein that has the capacity to assemble to form β-sheet rich fibrils. Oxidiative stress and metal rich environments have been implicated in triggering assembly. Here, we have explored the composition of Lewy bodies in post-mortem tissue using electron microscopy and immunogold labeling and revealed dityrosine crosslinks in Lewy bodies in brain tissue from PD patients. In vitro, we show that dityrosine cross-links in α-syn are formed by covalent ortho-ortho coupling of two tyrosine residues under conditions of oxidative stress by fluorescence and confirmed using mass-spectrometry. A covalently cross-linked dimer isolated by SDS-PAGE and mass analysis showed that dityrosine dimer was formed via the coupling of Y39-Y39 to give a homo dimer peptide that may play a key role in formation of oligomeric and seeds for fibril formation. Atomic force microscopy analysis reveals that the covalent dityrosine contributes to the stabilization of α-syn assemblies. Thus, the presence of oxidative stress induced dityrosine could play an important role in assembly and toxicity of α-syn in PD. Al-hilaly YK, Biasetti L, Blakeman BJ, et al. Sci Rep. 2016;6:39171. The hexapeptide PGVTAV suppresses neurotoxicity of human α-synuclein aggregates. In Parkinson's disease patients, α-synuclein is the major component of the intracellular protein aggregates found in dopaminergic neurons. Previously, short synthetic α-synuclein-derived peptides have been shown to not only prevent α-synuclein fibrillation but also dissolve preformed α-synuclein aggregates in vitro. The hexapeptide PGVTAV was the shortest peptide that retained the ability to block α-synucleinfibrillation. For preventative or therapeutic effectiveness, a treatment must suppress the neurotoxicity of α-synuclein aggregates and remain stable in plasma. The present study shows that specific peptides can protect neuronal cells from α-synuclein aggregation-induced cell death. The β-sheet-breaking hexapeptide PGVTAV remained intact in human plasma for longer than one day, suggesting that it may be a candidate for the development of therapeutics to treat Parkinson's disease. Choi MY, Kim YS, Lim D, et al. Biochem Biophys Res Commun. 2011;408(2):334-8.